Have you ever heard about the Gardner Hill gold mine or the healing powers of Apinol? Do you remember the Brightwood Inn or the antics of Slammin' Sammy Snead? 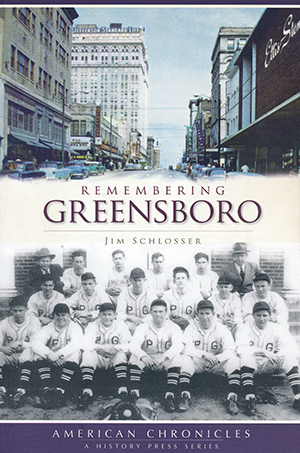 Culling the best from News & Record reporter Jim Schlosser's hundreds of history-related articles, Remembering Greensboro celebrates the unique history of Greensboro and Guilford County. From memorable events like the Woolworth sit-ins and the Greater Greensboro Open to beloved local heroes, characters and celebrities, Schlosser offers something for everyone who calls the Gate City home. Jim Schlosser retired in 2008 after 41 years as a reporter with the Greensboro News & Record. A Guilford County native, Jim's articles on Greensboro area history have won him a devoted following. He has published one book, The Beat Goes on: a Celebration of Greensboro's Character and Diversity, a collection of his articles put out by the Greensboro Bicentennial Commission in 2008. Five years ago, he wrote and directed a walking tour video of downtown Greensboro that was sponsored by the newspaper. He has served on the board of the Friends of the UNCG Libraries, who presented him with the 2009 Laurel Award for writing. He has also won several first places from the NC Press Association, the News & Record's Landmark Award for reporting (seven times); the Order of Long Leaf Pine (a state award for service), the Edward R. Murrow Award presented by the Greensboro Chamber of Commerce, and the Alumni Excellence Award from Guilford College. He currently serves as a board member at the Greensboro Historical Museum and volunteers in the archives weekly.